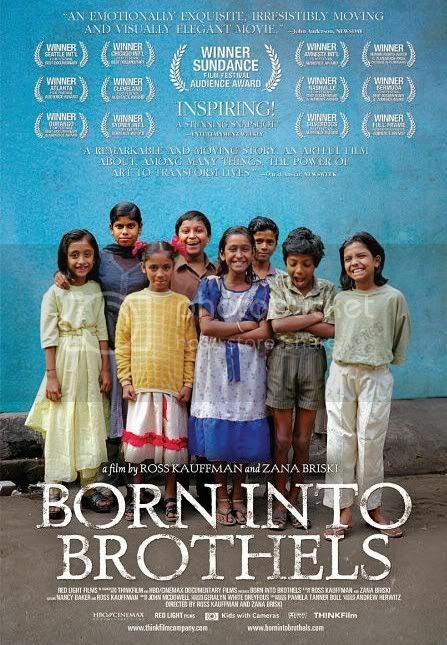 Born Into Brothels was the best Documentary winner at the 2005 Oscar Awards. The film is about a group of kids in one of the worst places in India: the Red Light district of Calcutta. I had been interested in this film for a while, as a result of growing up in Pakistan. It’s odd, though, because India is so different from Pakistan in a lot of ways. Pakistan being a strict Muslim country, such a district’s presence would draw immediate action from the authorities, both religious and municipal. Things such as prostitution surely continue, but they are more carefully hidden. The film follows a young woman (co-director Zana Briski) as she tries to teach a group of children how to take pictures, how to frame the shot, and how to possibly have a chance at rising above their current lives. These kids have no hope. Their mothers are prostitutes, their fathers are either drug addicts, drug dealers, or pimps. When the young girls grow up (one of them isn’t more than a year or so off when the film was made) they too will be prostitutes. The boys will make or sell drugs or illegal alcohol. They have no chance at anything else. No boarding school will take them; they don’t have the proper paperwork or birth certificates, and besides, they’re from the red light district. Some may go to school for a while, but mostly they work at home cleaning and fetching things. They help support their families, since their fathers are so worthless and their mothers are merely prostitutes. Zana’s goal is to attempt to give them a chance. Perhaps she can get them into a boarding school where they can learn and study, and perhaps one day have a shot at higher education. Then they can get real jobs and support themselves properly and legally. But Zana, too, faces a great deal of challenges. The kids’ parents are very unwilling to let them leave; by doing so they’re losing part of their income. It is a very sad and difficult situation, but she perseveres. She gets some media coverage and holds a local show for their photos, and enables one to get to Amsterdam (if the paperwork gets through) to an international event. As the film follows her efforts to teach the children about photography and give them a sense of purpose and achievement, we also get the chance meet the kids. We see how they live and are abused. We see how they are still happy children some of the time, playing in the streets and bugging each other. They’re very cute kids and the film is rather heartbreaking at times, given their circumstances. From a technical standpoint the film is nicely made. It’s short and to the point, doing a good job of moving through the slight narrative structure. This makes it easier for the viewer to stay interested and involved. The film is something different, a slice of life from a place far away that is a lot worse than anything most Americans will ever experience. It can be difficult to watch at times, showing the human condition as it ought not to exist. Regardless, it’s a moving picture of the lives of the children, and a very worthwhile film. This entry was posted in 3 pirate flags, 3.5 stars, B, Movie Reviews on December 18, 2009 by Tim Irwin.